apostille birth certificate | Notary & Apostille Service, Inc. If you have a New York City Birth Certificate or a New York State Birth Certificate & you are trying to get an New York State Secretary of State Apostille on your Birth Certificate and everyone is telling you, that you need the Letter of Exemplification to get an Apostille; don’t worry because Notary & Apostille Service can get an Apostille on your Birth Certificate without the Letter of Exemplification. So, what is this Letter of Exemplification? 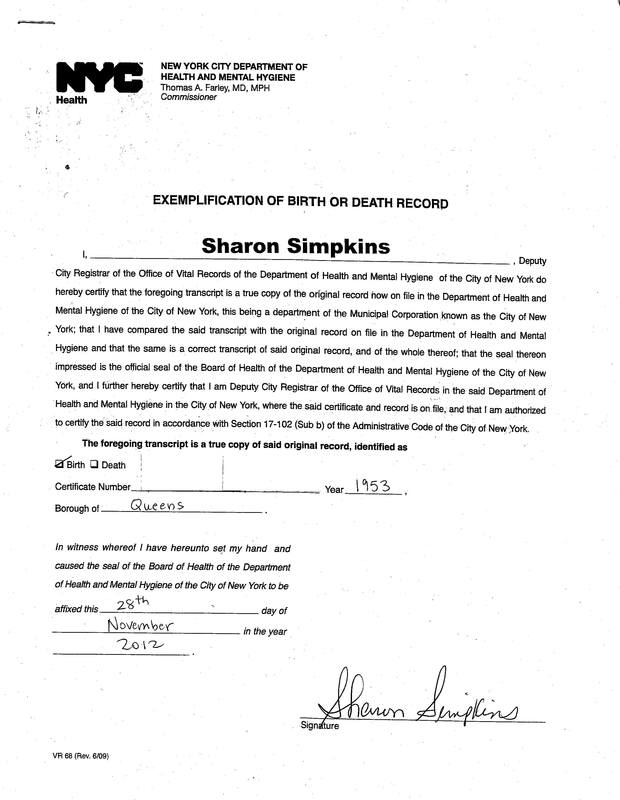 The actual name of this letter is call The “Letter of Exemplification of Birth or Death Record”. The Letter of Exemplification is only issued for New York City Birth Certificates when you order the “long form” or “vault copy” Birth Certificates. It is not issued with the short form and you can not go to the Office Vital Records at 125 Worth St to get one. It is only sent via the mail. Then why is it that everyone is telling me that I need a long form Birth Certificate and this Letter of Exemplification? Many Apostille services tell you this because this is what the Office of the New York State Secretary of State is telling everyone and this is what The Manhattan County Clerks Office is telling everyone who comes in without the Letter of Exemplification, that they need it. I not saying that they are wrong, I’m just saying in NYC, that is the normal procedure to follow. New York State has 62 county clerks’ offices & 5 of them are located within New York City & they all operate a little differently. Notary & Apostille Service will go that extra mile, for our customers, to any of the other County Clerks’ Office to get your Birth Certificate verified & Authenticated so you can get an Apostille without having the Letter of Exemplification. Therefore, it does not matter if you have the short form birth certificate or the long form birth certificate if the City Registrar’s name on your Birth Certificate is any of the following we can help you get your Apostille without the letter of exemplification. Even if the City Registrar name is not listed below just send us a scanned copy of your Birth Certificate so we can verify if it can be Authenticated & Apostille. To get your New York City short form or long form Birth Certificate Apostille without the Letter of Exemplification go to Notary & Apostille Service click on “Contact US” then click on the “Getting Started” link. Notary & Apostille Service, Inc. is a private for profit company registered in the state of New York. We help our clients get their documents legalized (Apostille) for use in any foreign country since 2009. We are a New York State company that offers you a Safe, Reliable, and Affordable Apostille Service. We are not related to any governmental agency. We do not issue or sell documents. We are not lawyers and we do not give legal advice, tax advice or any other legal or professional advice of any kind.